We know from working with hundreds of business owners and managers that professional women are very careful about managing their time. They also look for smart ways to improve their companies while balancing their lives. The Valley Sierra SBDC was inspired to hold the first annual Business Women’s Symposium in 2015 to provide women like you with an opportunity to learn new ideas, network with other women, and be inspired by successful professionals. 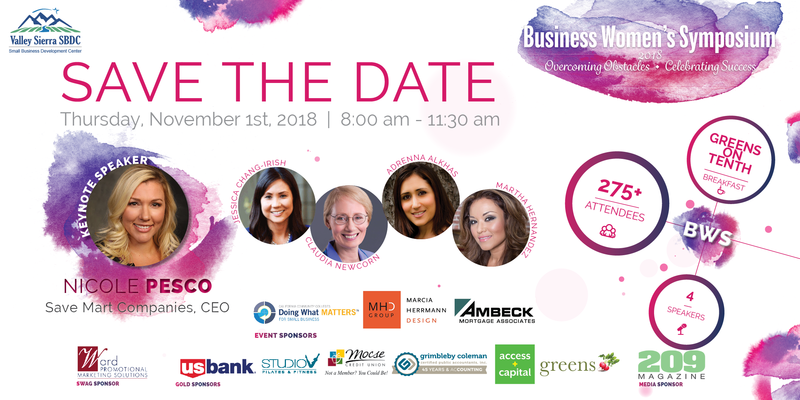 Enjoy a delicious breakfast catered by Greens On Tenth while hearing from our keynote speaker and a diverse panel of business women who will share how they balance rising careers and personal pursuits. There will be a Q&A session, raffle prizes and a networking event so you can start your day off right!